Friggitelli are not at all spicy. They differ from the spicy green pepper (peperoncino) in colour and shape. The spicy peppers are dark green, whereas friggitelli are pale light green. Spicy peppers also are quite smooth, whereas friggitelli have a slightly lumpy or wrinkly appearance. Italians normally eat friggitelli as a contorno (a vegetable side dish), or with other items as antipasti. You can fry them gently in oil or cook them in the oven. I prefer the second method since you use a lot less oil and they also turn a little crunchy, like potato crisps. Here’s how to cook them in the oven. Enjoy! 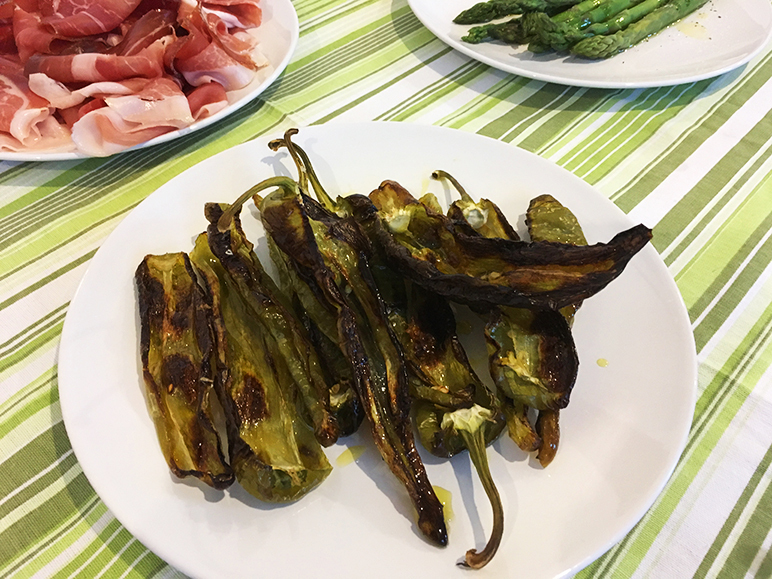 Crispy sweet Italian peppers cooked in the oven. A healthy vegetarian side dish. Preheat the oven to 180° C (355° F). Cut them in half lengthways and remove the seeds. Salt to taste and drizzle with olive oil. Sprinkle with parmigiano reggiano (or vegetarian alternative) cheese. Place in the oven for 20-25 mins. Friggitelli go very well with crostini, cold meats, and other antipasto ingredients. Hi, good morning. The frigitelli or as we known them in Spanish, pimientos dulces or in English Sweet Peppers / Cuban Peppers at Supermarkets, is part of our diet in Puerto Rico, in all the Caribbean Islands including Latin America, all year ’round. Hi there, thanks for the comment. Wow, that sounds like a great way to eat them. Italian dishes tend to be a lot less complicated. We prefer to cook things as little as possible to enjoy the flavours of fresh ingredients. Friggitelli, of course, like tomatoes originate in your part of the world. We Italians have taken them and made them our own. Have a great day in Puerto Rico.